alaTest has collected and analyzed 111 reviews of Toshiba 48U7653DB. The average rating for this product is 4.4/5, compared to an average rating of 4.6/5 for other products in the same category for all reviews. Reviews about the design and sound are generally positive. The price and usability also get good feedback. Many are less positive about the remote control. We analyzed user and expert ratings, product age and more factors. Compared to other products in the same category the Toshiba 48U7653DB is awarded an overall alaScore™ of 89/100 = Very good quality. The remote sometimes does not seem to work and takes ages for us to get it talk to the tv. 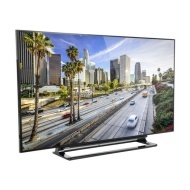 Toshiba 48U7653DB Ultra HD 48 inch TV.
" I'm happy with this TV. " " Absolute fantastic tv! " " All in all, you could pay more and get better/more but this tv is great value for those not needing the absolute high end gear. " " Connectivity is easy but screen set-up is a bit faffy. Picture quality is only ok, not as sharp as the LG it is replacing. Pretty decent on HD channels. " " Great picture and sound quality "